With more than 18 years experience in the facility management industry, Glen Riley founded B.P.R Facility Services in 2012. Riley's new company needed a logo, a website and some great visual branding. LW Creative Group worked with him on a logo to reflect his business as well as an efficient and effective one-page website filled with relevant information for current clients and potential customers. B.P.R. Facility Services offers one-stop, high-quality building maintenance services for small business on the South Shore. 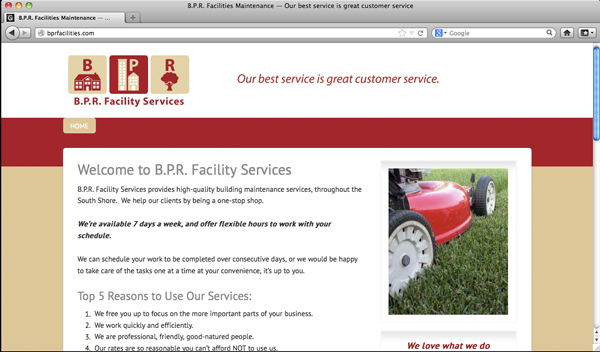 From janitorial services and landscaping, to small carpentry projects or trash and snow removal, B.P.R. has it covered.